Only 47 Chinese white dolphins left in Hong Kong and one new born baby was sighted! What do these data mean? 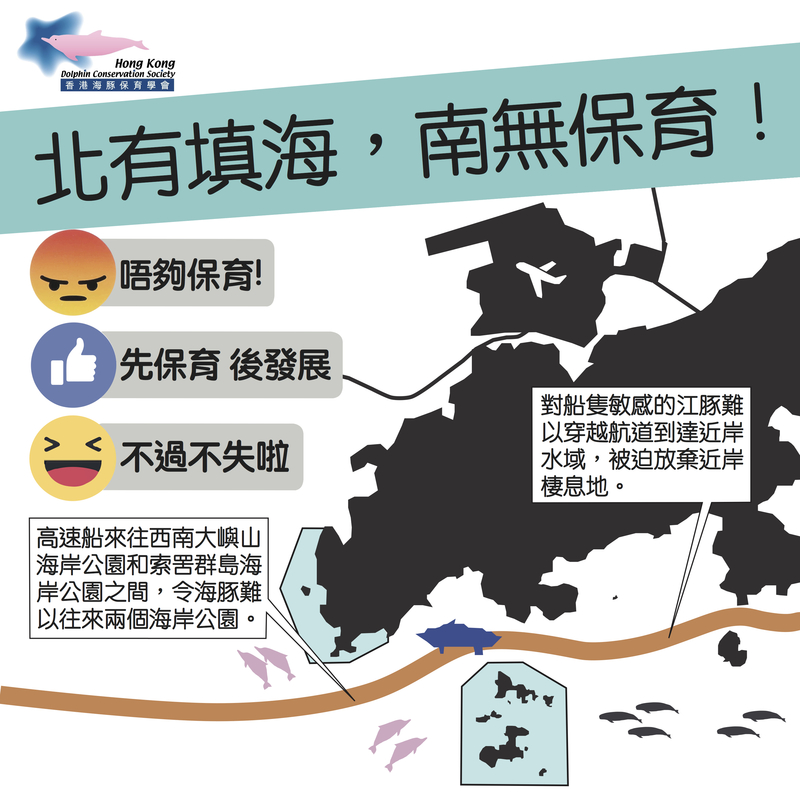 There are two marine parks in Hong Kong for CWD and yet why they are still dying? Could the proposed marine parks save the dolphins? How can we avoid turning CWD into collective memory but keep them in our waters? Watch the dolphin short notes and you will find out the answers. And don’t forget to sign the petition to save dolphins! It’s been 20 years since the handover of Hong Kong. 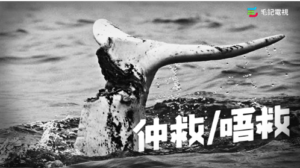 Chinese white dolphin(CWD) was chosen to be the handover mascot on July 1, 1997. 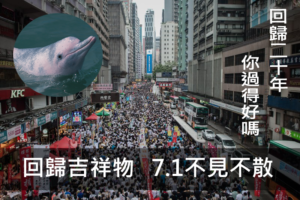 Since then, Chinese white dolphins have been connected to Hongkongers. How are you doing in these 20 years? Some Hongkongers are living in subdivided flats and so as CWD that only fragmented habitats are left for them after the sea is being ‘reclaimed’ by human. Students in Hong Kong are overwhelmed by stress and resolved by suicide while CWD is having a low birth rate. Country parks might be robbed by the developers and government while the marine parks for CWD are losing their function. For 20 years, some Hongkongers are planning to migrate out of Hong Kong while CWD is disappearing in Hong Kong. July 1, 2017, when some Hongkongers are still voicing out for Hong Kong, our home. With time, even though we are losing our treasures, yet we fight despite our exhausted bodies, for CHINESE WHITE DOLPHIN, for our HOME. Another group of dolphin ambassadors finished their training on 10 June. 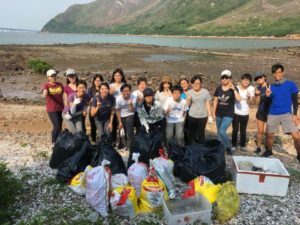 Ambassadors had finished training of classroom, land-based dolphin watching and beach cleaning. 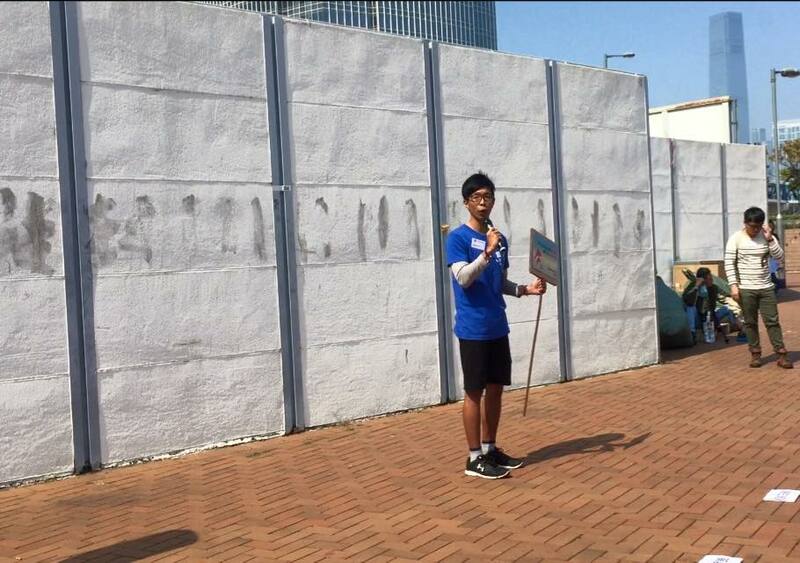 They would do voluntary services with HKDCS in the future to help holding more activities for the public! If you are interested in the Dolphin Ambassador Programme, please visit here. The Sustainable Lantau Blueprint was unveiled on June 3, 2017. HKDCS was disappointed by the blueprint as it failed to balance conservation and development as titled in the blueprint. There were no new dolphin-related conservation measures advocated in the blueprint but merely listing our the proposed marine parks. 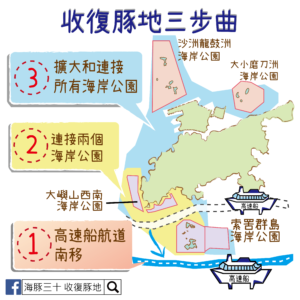 HKDCS suggested to designate a new big marine park in west and southwest Lantau to connect the proposed fragmented marine parks; and divert the high speed ferries in South Lantau in order to protect the dolphins! 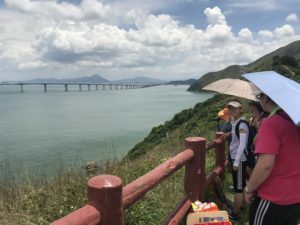 Read here for the response from HKDCS to the Sustainable Lantau Blueprint and sign the joint green groups petition in response to the blueprint! 13 May Empty the Tanks! 10 am at Ocean Park! Come and Join us! Empty the Tanks is an international event. People all over the world protest in front of dolphinarium in their countries and urge visitors to stop buying tickets and boycott dolphin shows. People also educate visitors the cruel truth about dolphins in captivity. 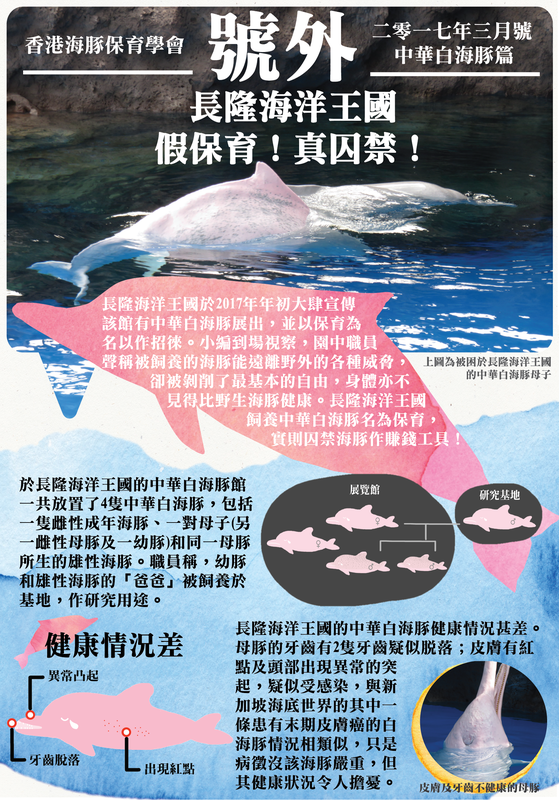 Like past few years, Hong Kong Dolphin Conservation Society assists Dolphin Family to hold this event in Hong Kong. 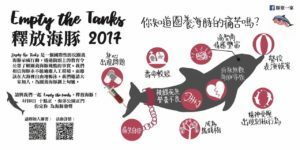 This year, apart from the protest in Ocean Park on 13th May (Saturday), we hold street stalls to education the public and promote Empty the Tanks.You are cordially invited to join us! Please click ‘Going’ in Facebook and keep updated with the latest news! Thanks to the invitation from Chatteris Educational Foundation, our chairman, Mr. Taison Chang, had talked to the teachers from the organisation. 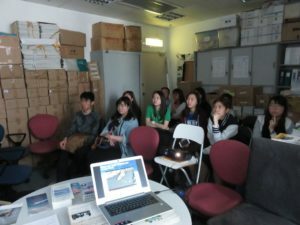 Mr. Taison introduced the work of HKDCS and updated the Chinese white dolphins. The sharing focused on what the public can actively do to protect the dolphins. 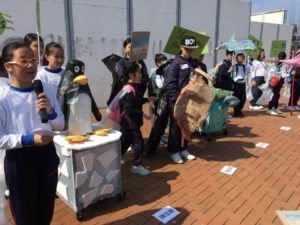 It was hoped that teachers would spread the message and inspire their students to actively conserve the dolphins. HKDCS’s is holding a porpoises and dolphins research trip with the theme ‘Dolphin Hubbles’ on April 14, 2017 (Fri)! 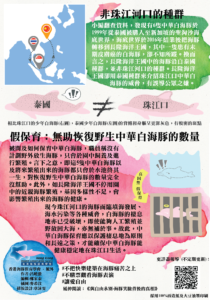 Szeto So Sum, the founder of SoSum Natural Soaps, was invited to join the trip and share her view on protecting dolphins and dolphins in captivity. What’s more, So Sum will give out soaps to participants who answer our questions correctly. How can you miss this ‘Dolphin Hubbles’ porpoises and dolphins research trip? 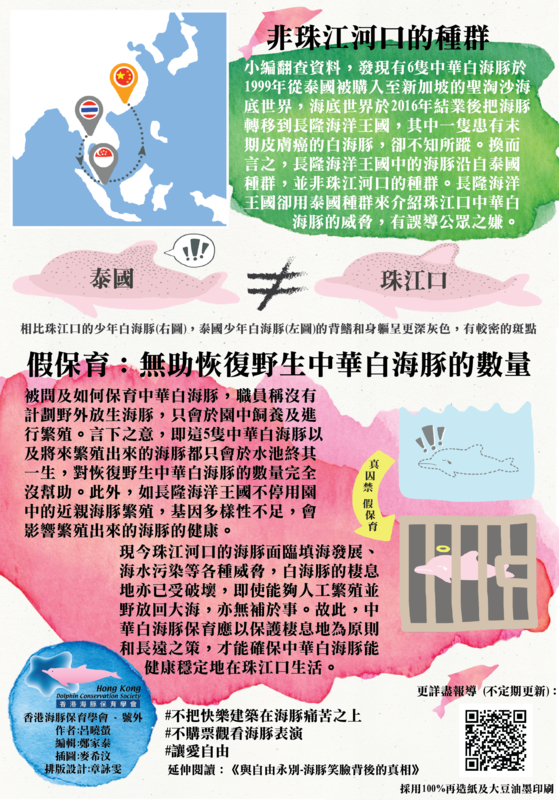 Mr Taison Chang, the chairman of Hong Kong Dolphin Conservation Society, shared his view on dolphin captivity and experience working with wild dolphins and captive dolphins in Ted Talks. Why should we not keep dolphins in aquariums? Let’s see how he answered the question! Extra! Chimelong Ocean Kingdom fake conservation but real imprison! Chimelong Ocean Kingdom bought 5 Chinese white dolphins from Singapore which were originated from Thailand. Chimelong Ocean Kingdom even called it as a combination of ‘research’, ‘education’ and ‘conservation’. But in fact, they are just using the dolphins as money-making tools to attract tourists. Hong Kong Dolphin Conservation Society condemns this and had made an inspection. An extra was also released to report the fact to ensure the public learn about the correct understanding! Do you still remember WL212? The Chinese white dolphin with seriously injured peduncle in 2015. One of the programmes of a popular Hong Kong online media ‘TV Most’ has featured the case of WL212. To save or not to save? The programme has interviewed Hong Kong Dolphin Conservation Society on this. Let’s watch the video in the following link. 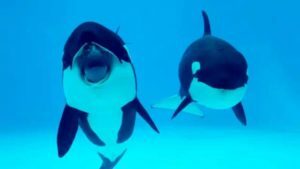 The killer whale breeding center of Chimlong Ocean Kingdom has opened on February 24, 2017. 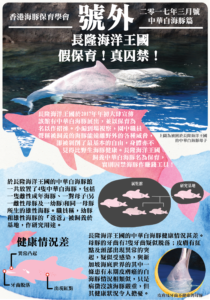 Hong Kong Dolphin Conservation Society has released a press with regard of this. The society concerns the captivity industry in China. It is worrying that with over 39 aquariums in China, these aquariums would follow Chimelong Ocean Kingdom to import and keep killer whales in order to keep up with the competitiveness. This does not only convey a wrong conservation message to the public but also harm the population of killer whales by catching them in the wild. The society urges the public to boycott aquariums and dolphin shows. Never buy a single aquarium ticket. With no audience for captive dolphins, there will no longer be a captive industry. Want to protect dolphins? You can start with reducing waste! In response to Cultamap’s art parade, students from 4 primary and secondary schools reused wastes to make art and fashion clothes and paraded in Central. There are more and more whales died because of marine debris in recently years. Reducing marine debris does not only bring a better home to marine lives but also save their lives! 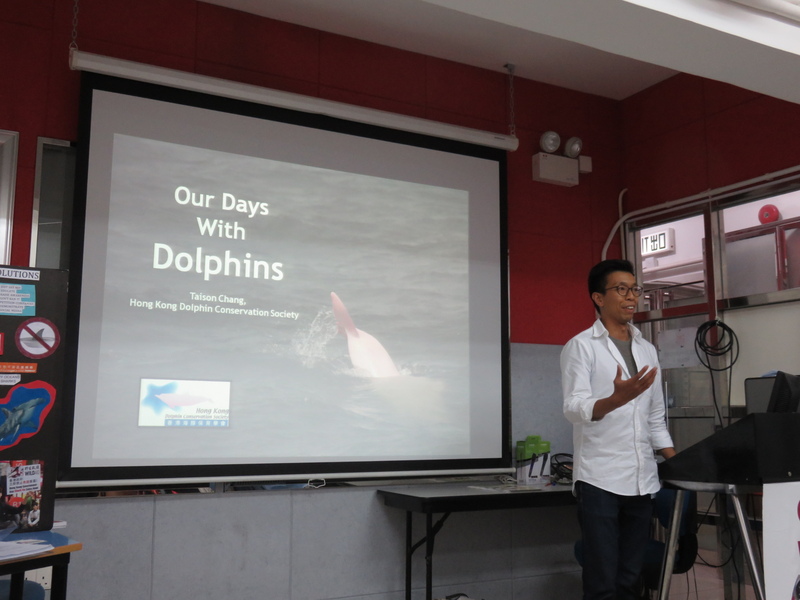 Mr Taison Chang, the chairman of Hong Kong Dolphin Conservation Society, shared the view of conservation on that day. We hope everyone can make the ocean a better place to live by reducing waste! Mr Taison Chang, the chairman of Hong Kong Dolphin Conservation Society, shared the view of conservation on that day. 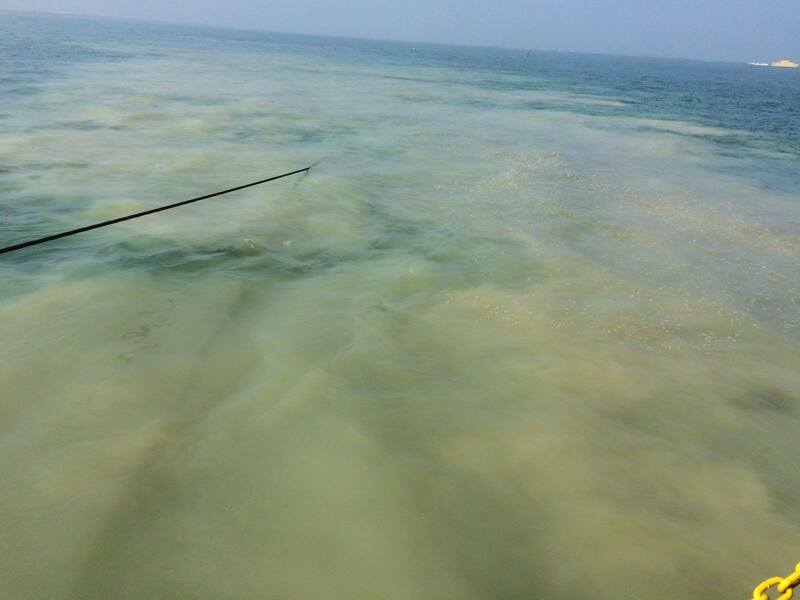 Want your students to learn about Chinese white dolphins and finless porpoises? Want to know the global issue of cetaceans? Want to learn out of classroom? Want to see dolphins popping out from waves? The secondary & primary school education programme satisfies you! Through a series of activities, this programme deepens students’ knowledge toward cetaceans and raises the conservation awareness. The activities include roll up stand banner exhibition, school talks, movie sharing, beach cleaning and dolphin watching! Read here for details and email to yuki@hkdcs.org to apply! The dolphin ambassador programme has launched on February 13, 2017! Join our programme to be volunteer if you care dolphins and are responsible! Once you have 20 hours of training and volunteer work, you will be rewarded with a dolphin ambassador certificate! Want to help us to protect the dolphins? Apply and read the details! 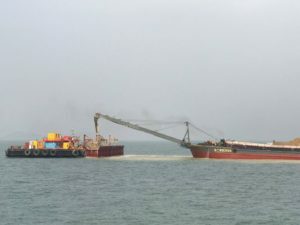 Hong Kong Dolphin Conservation Society and Green Sense received a complaint from the public about the leakage of a sand barge in Third Runway Project. 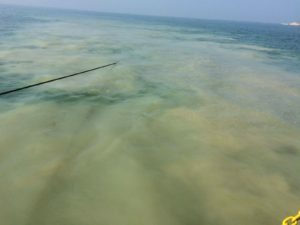 The project involves reclamation of 650ha in Northwest Lantau where Chinese white dolphins inhabit. 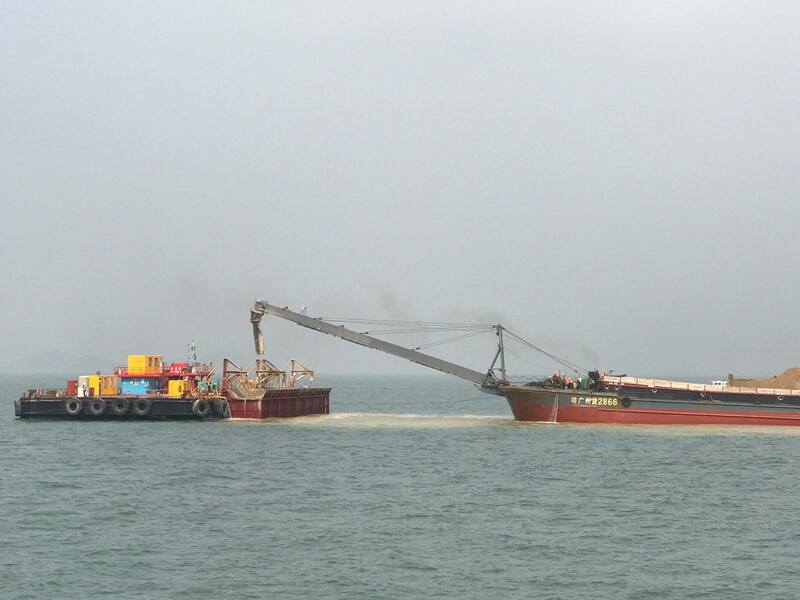 The leakage of sand barge severely pollutes water in the area and greatly affects dolphins and other marine lives! The society could not tolerate this violation of the environmental permit. Joining hands with Green Sense, a formal complaint has been made to the director of Environmental Protection, Mr Donald Tong and the chairman of Advisory Council on the Environment, Mr Stanley Wong. We will keep watching the project to make sure the environmental permit is strictly abided to mitigate the impact on dolphins and other marine lives! We also need the public to help to keep an eye on the project and guard the dolphins! See ‘30 Third Runway Victims‘ for detailed information on the impact of Third Runway to dolphins. The Brothers Marine Park was designated on 30 December 2016. 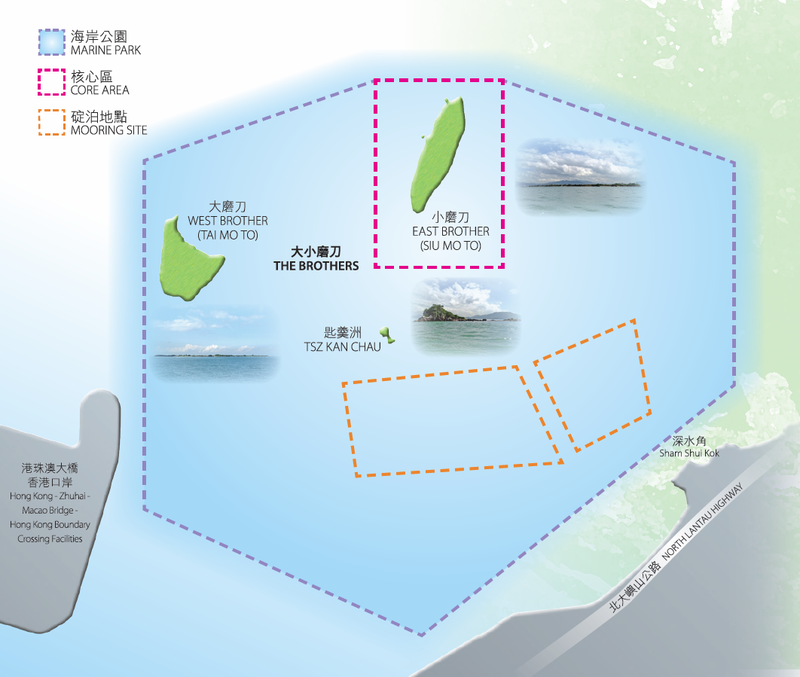 With an area of 970 hectares, it is the second marine park designated for the protection of Chinese White Dolphins. 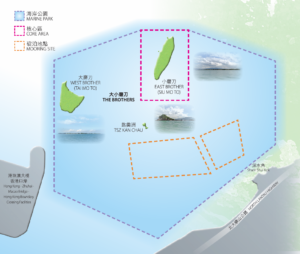 It is located in Northeast Lantau, near the artificial island of Boundary Cross Facilities which is still reclaiming. It was hoped that the marine park could help recover the dolphin abundance in Northeast Lantau from zero in 2015.However, the construction of third runway has started in close proximity before the establishment of the marine park. This makes the effect of the marine park unknown.